Yes, fireworks have returned to downtown. This year, courtesy of Butler’s Steak & Ale, the Contented Cow, Chapati, and Pan Pan, there will be fireworks in Ames Park, followed by fireworks in Sechlar Park. There is, however, much more than fireworks going on in downtown this Independence Day weekend. Thursday, July 1st, New Beginnings – A Farewell Exhibit, 4 to 7 p.m., ArtOnWater Gallery, Young People’s Theater: History/Misstory, 5:30 p.m., ARTech School, Northfield Community Bank Concert, 7 p.m., Bridge Square, Chris Herriges, 8 to 11 p.m., Tavern Lounge, Study Hall, 9 p.m., Contented Cow, and Karaoke at Froggy Bottoms. Friday, July 2nd, YPT: History/Misstory, 10 a.m., ARTech School, Farmers’ Market, 11:45 a.m., Riverside Park, New Beginnings – A Farewell Exhibit, 4 to 7 p.m., ArtOnWater Gallery, Tim Freeland, 6 to 8:30 p.m., Butler’s Steak & Ale, The Favourite Child, 8 p.m., Contented Cow, Carey Langer, 8 to 11 p.m., Tavern Lounge, Observatory Open House, 10 p.m. to 12 a.m., Goodsell Obeservatory on the Carleton College campus, and D J Music at the Rueb’N’Stein. Saturday, July 3rd, Farmers’ Market, 9 a.m., Riverside Park, Riverwalk Market Fair, 9 a.m. to 1 p.m., Sesquicentennial Legacy Plaza and Riverwalk, New Beginnings – A Farewell Exhibit, 4 to 7 p.m., ArtOnWater Gallery, Brothers Burn Mountain, 5 p.m., Contented Cow, Wendy Russell, 6 p.m., Butler’s Steak & Ale, Spruce Top Review, 7 p.m., Contented Cow, Jon Manners, 8 to 11 p.m., Tavern Lounge, and D J Music at the Rueb’N’Stein. 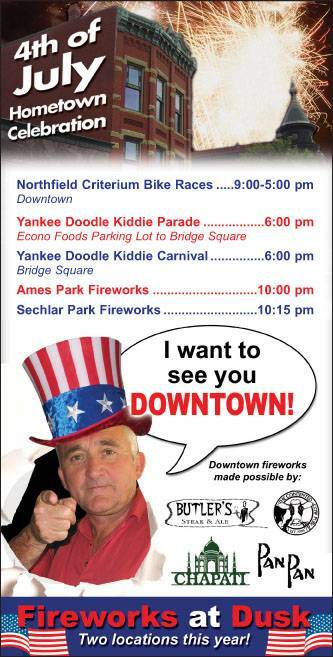 Sunday, July 4th, Northfield Criterium Bike Races, 9 a.m. to 5 p.m., Downtown Northfield, Yankee Doodle Kiddie Parade, 6 p.m., Yankee Doodle Kiddie Carnival, 6 p.m., Bridge Square, Politics and a Pint, 6 p.m., Northern Roots Session, 7 p.m., and Quiz Night, 8 p.m., all at the Contented Cow, Fireworks, 10 p.m., Ames Park, and Fireworks, 10:15 p.m, Sechlar Park.